I used my Fountainhead Caddis 360 yesterday (11-8-13) while fishing the Lower Illinois River in Gore, OK. I have previously caught bluegill and small bass with my rod but yesterday was the first time to catch rainbow trout. I was using a fluorocarbon line with a 6X tippet. I had a tan size 20 zebra midge on the bottom and a red size 16 midge above it. Caught three trout with this setup. What a hoot!! How do you like the Caddis?? I've seen it out there before, but I've been a little bit put off by how low the price is...what's your opinion on it? 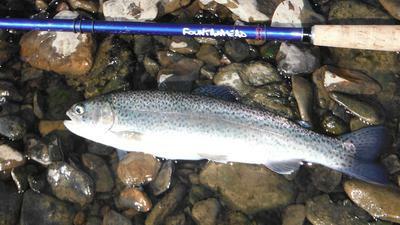 At first I was taken back by the softness of the Caddis rod but once I got the feel for it I have had a great time. I have caught numerous bluegill and small bass with it in pond fishing. I used it twice on two different rivers trout fishing and had a great time. For the price I think it is a good buy and the customer support by Paul has been great.